Besan Laddoo is one of the Laddu or laddoos that are common in India. A must have to make any celebration, festivals or religious occasions. 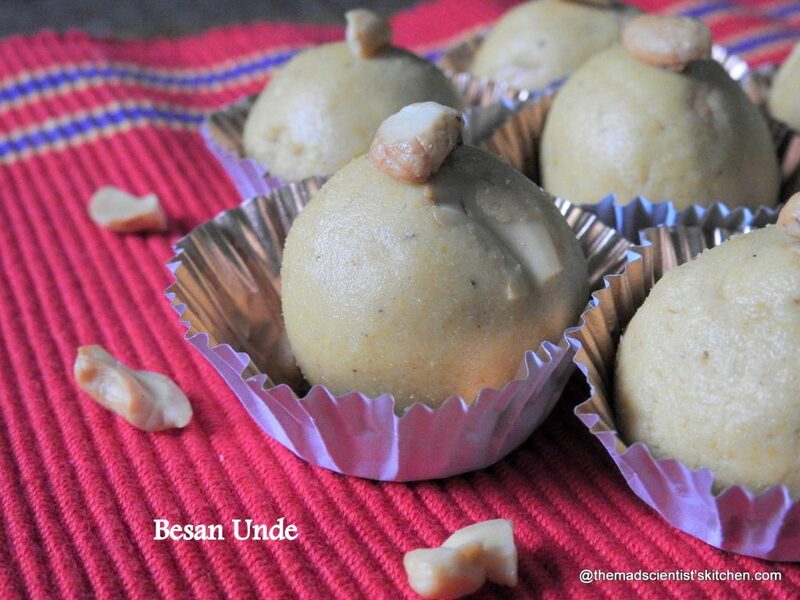 Laddus or Unde as they are known in Karnataka, are ball-shaped sweets popular in the Indian Subcontinent. Ladoos are made generally of flour and sugar/ jaggery the ingredients will vary by recipe and households too. Here are the various Ladoos from my place. Not many mind you for my family do not like sweets. 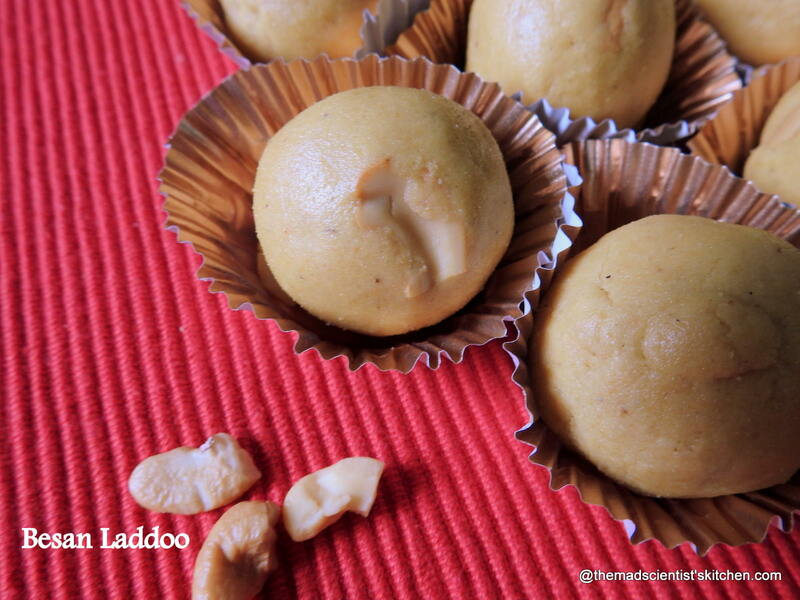 Aliv che Ladoo, Dates Ladoo, Maledi – Chapati Ladoo, Til /Sesame Seed Ladoo. Today I plan to rectify one missing childhood favourite. Besan Ladoo or Besan Unde as they were something we used to try and eat as many as we could lay our (grubby) hands on as kids. The results of eating too many of them are frequent tummy upsets. So if there are these Ladoos at home then Amma was sure we will be visiting the Loo once too often. Besan laddu (Hindi: बेसन के लड्डू) is a popular Indian sweet dish made of (chickpea flour or gram flour), sugar and ghee. Besan is roasted in ghee till golden brown appearance with a nutty fragrance. Then sugar is added to it. Pistachio pieces are also mixed in this mixture optionally. Sweet balls are then made from this mixture. It has a long shelf life. It is often served at festivals, family events and religious occasions in India. So let’s make Besan Ladoo today as I was not confident of the proportions I asked my Buddies and I had so many inputs. Thanks, Ladies what I will do without you gals!!! In a thick kadhai/wok mix the ghee and besan. On low flame keep stirring the besan. You will need about 20-25 min. Your batter consistency should not be runny but more like a paste so do not add all the ghee at once. You can always add a little later. You have to continue stirring till the colour changes from yellow to deep amber and the aroma is heavenly. Switch off the gas and let it cool fully. Add the cardamom powder and sugar. Mix well. Now make small balls of the mixture and stick a nut before rolling it into a smooth ball. 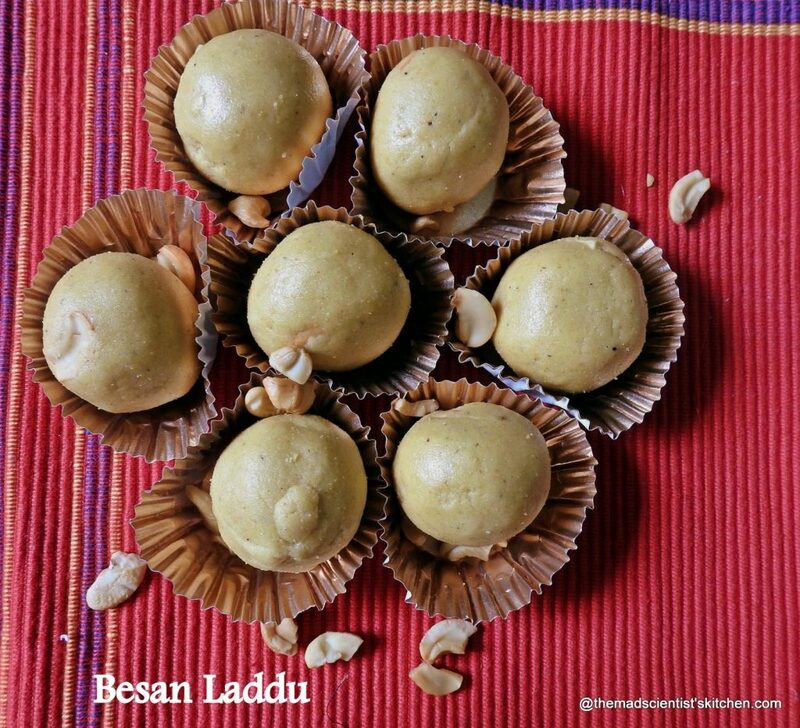 All time favourite besan laddoos and they looks extremely delicious. Those laddos have surely turned out so delicious Arch..good job in shaping it so neatly! Not sure if my comment came through!..the laddos look very nicely shaped..very delicious one..
Amazing besan ladoos, perfectly shaped. These have come out so well – perfectly round and shiny. Love laddoos anytime and began ones top the list ! Perfectly made beauties . Ladoos look so good and perfectly shaped, Archana! Superb! Perfectly made besan laddoo. They look amazing. The laddoos are so smooth and perfect! Besan Ladoo are my favourite. Looks yummy.